If you haven't noticed, people, in general, are more alike than different. If you prick us, we bleed. If you love us, we appreciate it. And if you mention "pizza," we have an opinion. Pizza has evolved to a point of global ubiquity. And cuisine from all over the world has influenced the way we eat pizza in America (here's looking at you, particularly, Indian pizza). But as our country -- and most other countries, really -- rises to a level of unprecedented pizza-appreciation, it's time to check back with the source, lest we suffer from the culinary bends. What do Italian chefs working in the States -- like, the ones actually from Italy -- really think about American pizza? Do they like dollar slices after a long night of drinking, like the rest of us? Is chain pizza an affront to their national sensibilities? Is pizza really better in their country, or is it just something that people who studied abroad in Firenze like to say while pretending like they actually lived there? We asked Italian chefs about American pizza. And here are their answers. The good, the bad, and the ugly. You might assume a classically trained Italian chef might be apt to rip on American pizza without too much prodding. And yeah, that turned out to be fairly accurate. Especially when the subject turned to chain pizza. "It's my least favorite kind of pizza. They should call it flatbread with bad toppings," said Nicola Marzovilla, a Puglia native, chef, and current restaurateur for i Trulli. Simone Falco, Owner and Executive Chef of both Rossopomodoro and SIMÒ Pizza restaurants -- and proud Napoletani -- tends to share this assessment. "I've tried that kind of pizza, mainly for interviews and things like that, never really because I wanted to," he said. "To me, those big chains aren't food companies. They're production companies, distribution companies. Taste is almost secondary to them being able to deliver a consistent product in little time throughout the country. They do that well, but they don't do pizza well. And in places like New York, you can usually find better quality pizza for the same price." And dollar slices -- which, in New York, are basically chains, didn't fare too well either in these chef's opinions. "I'll eat that cheap pizza, maybe on Sundays when I'm watching football or something. But I don't really treat it like a meal, I treat it as a snack," Falco said. "A good slice is a good slice," Marzovilla said. "But if it's not, it's not even worth the dollar." Convenience of consumption isn't necessarily the issue here, as both chefs recognized that commonly, in Naples, pizza is made to be folded and consumed on the go -- almost like the "snacking" concept Falco mentioned in relation to New York slices. But, they both conceded that they do think the pizza in Italy tends to be of a higher quality than your average New York pizza. The difference comes down to convenience of composition. Mainly through cutting corners -- and adding sugar. "Look, it's hard to make great pizza cheaply," Falco said, confirming the obvious. "And there's a historic precedent as to why cheap pizza in the States, tastes like it does." According to Falco, when pizza shops and Italian restaurants began opening in States in the early 20th century, the affordable tomato sauce would often have very high levels of acidity. To help balance this out -- and get it closer to the stuff they were used to, back home -- Italian grandma's (who naturally did the cooking) would add sugar to the mix. Over time, our palettes got adjusted to the sugar in cheap pizza, and pizza makers even started adding it to the dough itself. "If you pick the tomatoes before they're ripe, they are going to be too acidic," Falco said. "And usually, cheap tomatoes are picked before they are fully ripe." And it makes sense. The quicker you pick the produce, the more time you have to grow more produce. This same level of scalability-through-speed applies to the dough, too. Falco, for example, let's the yeast in his dough ferment for up to 36 hours before baking, while he says it's standard in other operations to only let it sit for six hours. "That's why you get so thirsty after eating cheap pizza," he said. "It's not high sodium or anything like that, the leftover yeast is actually expanding in your stomach." "That, combined with the sugar, just makes it not ideal for pizza. A lot of people might tell me: 'the best pizza in my life was the cheap place in my college town.' Well, maybe you just had a little too much to drink, and then were pumped full of sugar?" Falco said. "It might make you feel good. But it doesn't mean it's good pizza." Not all is lost, and there's certainly a contingency of Americans who are making -- and more importantly, craving -- quality pizza. "Despite the problems with cheap pizza, real, high quality Italian pizza is definitely seeing a resurgence in America," Falco conceded. 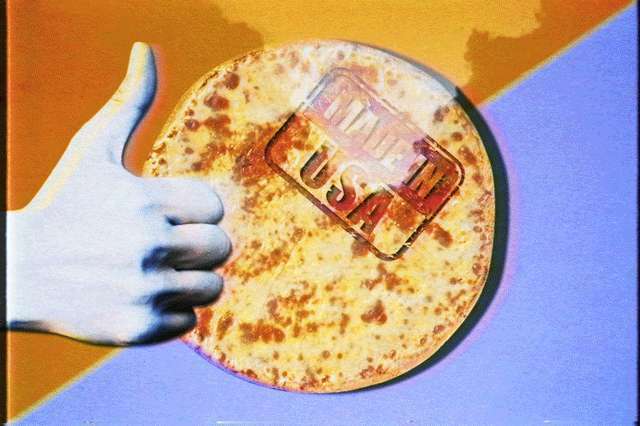 "I think people in America are appreciating better food in general, and that's definitely true of pizza. You can go to almost any city in America, and be able to find a good slice." While all of the chefs here saw fundamental problems with our pizza infrastructure -- where high levels of production and razor-thin margins lead to an inferior product -- they (like us, at Thrillist) believe that American pizza culture has never been held to a stricter standards. And that the tomato sauce-soaked bar is only getting higher for Stateside pizza makers. "Pizza is a good that's loved worldwide," Falco said. "It's good, it's filling, it's relatively easy to make. And while American pizza might not exactly be like Italian pizza yet, it's catching up. As long as people care more about quality and passion, instead of just making money, the pizza will be OK."
And the future of pizza in America should be OK, too.